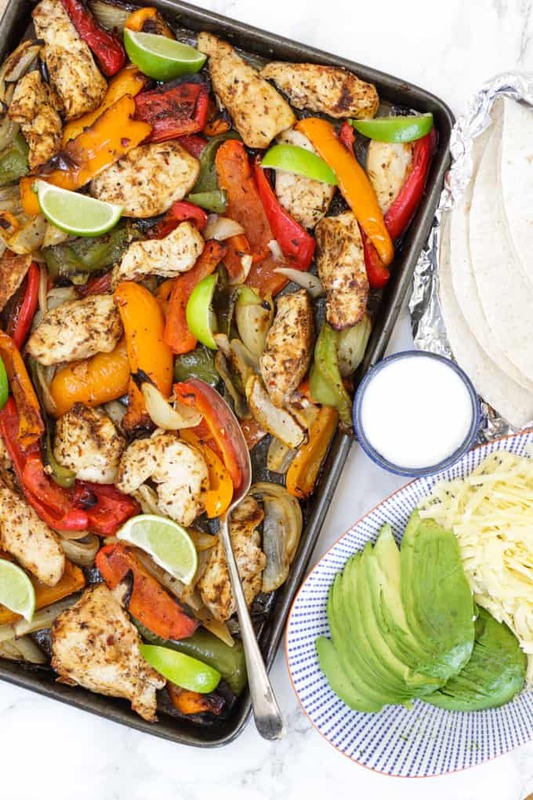 These Easy Baked Chicken Fajitas are a simple, quick family dinner. Chicken breast pieces, coated in fajita seasoning, with peppers and onions oven cooked to perfection. Serve with tortillas, sour cream or yoghurt, grated cheese and avocado for a complete meal. Would you think less of me if I told you that my mouth was actually watering uploading these photos and remembering eating these Baked Chicken Fajitas yesterday?! 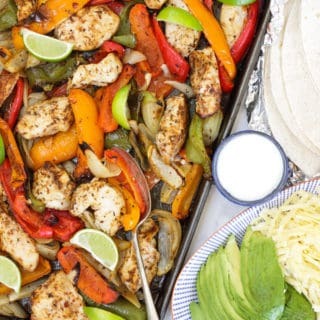 Asking for a friend..
Chicken Fajitas were so in fashion in the 90s, but whilst they aren’t quite as on trend now, they are still a staple family dinner and quite rightly so. Done right they are tasty, simple and veggie packed. This is the easy way that I always cook our fajitas. You can use the same method for steak or vegetable fajitas. It’s so simple but tasty, just how we like our midweek meals. Can you cook fajitas in the oven? Yes! Most fajita recipes call for the meat and vegetables to be cooked on a skillet or frying pan on the hob. It’s really simple to cook them in the oven though and it avoids the need to stirring. It also seems to keep the chicken deliciously tender. How long does it take to cook fajitas in the oven? 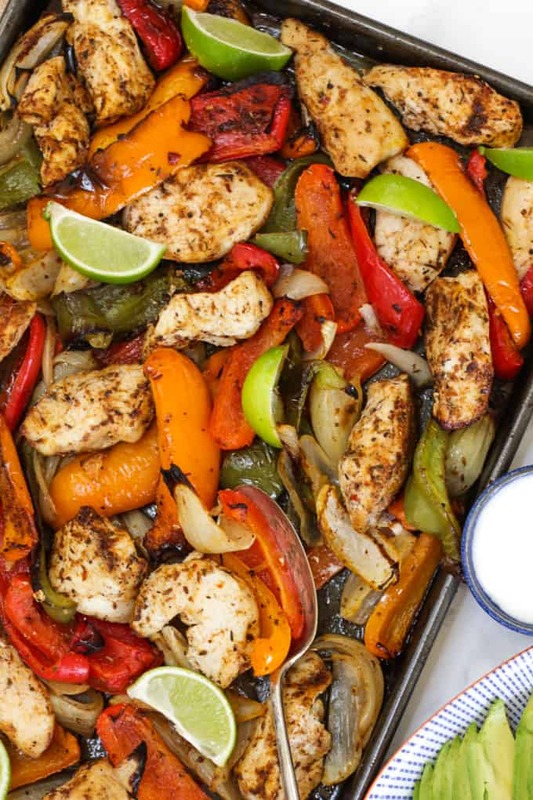 Chicken fajitas take 20 – 25 minutes in the oven when the meat is cut into large chunks. This is enough time for the peppers to start to blacken and the chicken to be cooked. Always check that chicken is cooked through before serving. Which vegetables are in fajitas? You can mix and match and use any combination that you fancy. The sweetness of roasted peppers and onions works really well and adds heaps of colour. What is a good side dish to have with fajitas? 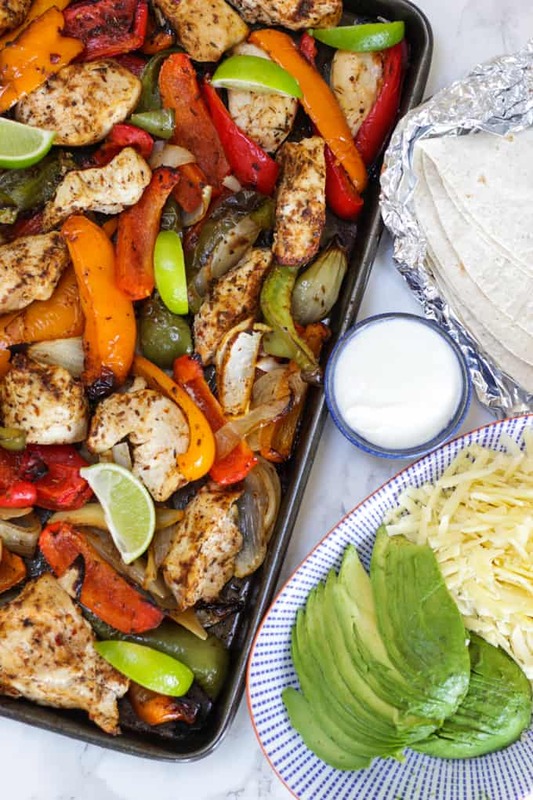 These Oven Baked Chicken Fajitas are best served with soft tortilla wraps, grated cheese, peeled and sliced avocados, lime wedges and sour cream/yoghurt. Shredded crispy lettuce makes a good addition too. A good baking tray is a so useful in the kitchen. It was a bit life changing for me when I bought a sturdy one rather than a cheap as chips one. This one is only about £7 on Amazon but is a really lovely addition to my kitchen kit. A sturdy sharp knife makes such a different when prepping veg like this. My old faithful is 15 years old now, but here’s the newer version of the Chef’s knife I love, available on Amazon. These make a great packed lunch the next day. Just pack leftovers into Tupperware tubs and enjoy. Hope you enjoy this recipe as much as we do. 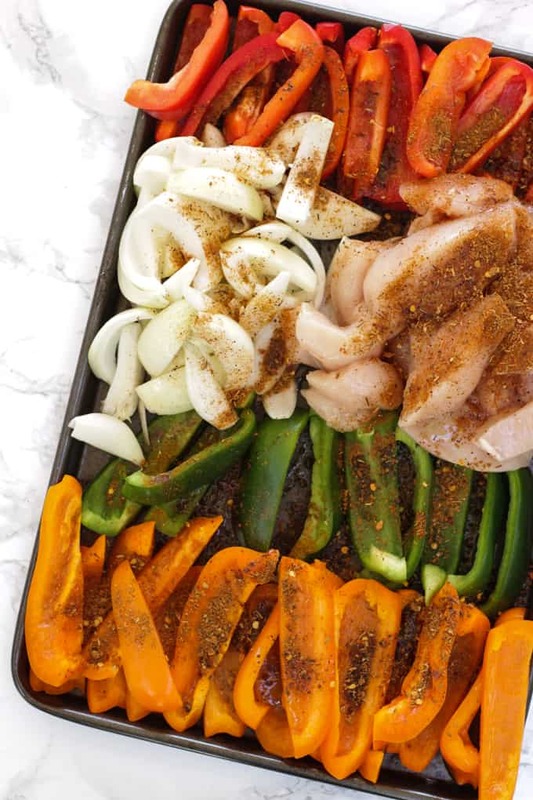 I’d love to know how you got on and what you thought of it if you make this Easy Oven Baked Fajitas recipe. 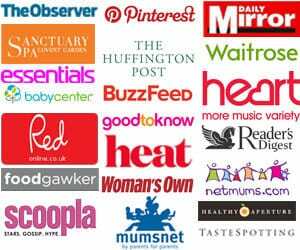 Please rate the recipe and leave me a comment below if you do. Put the oil, chicken chunks, peppers and onions onto a large baking tray. Mix together the fajita seasoning ingredients in a small bowl and sprinkle over. Mix thoroughly with clean hands. Bake for 20 - 25 minutes until the chicken is cooked through and the peppers are starting to blacken at the edges. Serve with the accompaniments and let everyone dig in and build their own fajitas. Perfect for Cinco de Mayo !